Rodent pets are wonderful to share your life with! A big part of the fun of owning them comes from creating their habitat-- learning what makes your pet happy and comfortable and putting that together with your vision of decoration, getting all the pieces together and arranging them just so, then watching your pal enjoy the world you made just for them! Most owners rely on commercial cage solutions to do this, but this page is all about the benefits and how-to's of doing it yourself with a custom bin cage. If you already have a commercial cage, and you like it but want to expand on it, bin cages can be easily incorporated into other setups as well, and they're inexpensive, roomy, and fun! I will tell you about the pros and cons of bin cages and how they compare to commercial ones, explain how to design and create them, share other great resources to learn more about bin cages, and I'll even explain how these unique habitats can benefit your favorite rodent rescue! What I will NOT do is tell you the one exact formula for making a bin cage, because there isn't one! The only limit to these habitats is your imagination, so I hope this page will inspire you and help you get a feel for just how much you can customize them, so you get lots of your own great ideas! Over the years, I have had quite a few pet rodents. Their charms are addictive! I have tried most of the differet cage types. There are several kinds readily available: fishtanks, wire construction, plastic enclosures, and module cages. Fishtanks and plastic enclosures are basically the same idea, only one is made of glass and the other of plastic. They are good in that it is easy to see your pet and the simple square design makes it easy to reach all areas of the cage for cleaning as well. Glass tanks are sturdy but very heavy, and plastic ones more lightweight, but both may crack or shatter if you drop them. Other than that they share the same challenges, which are lack of space and lack of ventilation. All rodent pets need adequate space for exercise and to minimize waste contaminating the food, water, or sleeping areas. Large tanks are costly and often still don't provide enough room on their own, and can need to be supplemented with add ons to ensure a healthy animal (unless your pet is getting a prodigious amount of out-of-cage time daily). The other issue with these is ventilation. 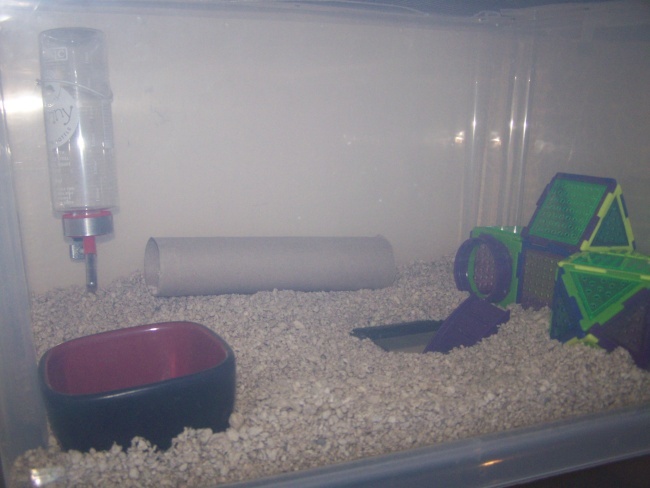 Proper ventilation is important for the health of a rodent pet. It keeps the temperature in the cage from becoming oppressive in warm conditions and is believed to help prevent several serious respiratory ailments that tiny mammals can be prone to. Experts argue about the ideal amounts of ventilation, but many fanciers think that an enclosed tank with the only air coming from the top is insufficient for a small mammal's comfort. I believe this is partly dependent on other factors and tanks can be a great solution with some thought, but will add the caveat that making sure the tank is placed properly is paramount, especially with a glass tank. If your pet is too near a window or other heat source you might as well bake them in the oven! Wire cages have amazing ventilation. You can find them in acceptably large sizes for prices that tend to be more modest than the other designs. They also provide climbing for animals that enjoy it. Mice love to clamber all over a wire cage, and look very cute doing so. But wire cages can quickly become a tidy person's nightmare as litter and bedding and unwanted food are jettisoned through the bars by your digging pet. And wire can be a hazard for tiny feet and tails. If you have other animals or small children in the home, it may be easier for them to antagonize or harm your rodent if you use a wire cage. Plus that awesome ventilation is a downside in a drafty house. A bin cage has wire mesh incorporated for ventilation, and you can place it much more strategically than using a cage entirely of wire. Module cages are very popular, and it's easy to see why because they are a lot of fun! Bright colors, innovative visual designs, loads of available accessories, and tubes and tunnels such that a person could easily create a habitat that winds all over the room. Imagine sitting at your desk or lying on your bed and seeing your rodent happily scampering overhead! Most module cages mix wire and plastic construction to improve ventilation while minimizing mess, but I've found that module habitats can often create a lot of crannies and corners that are very fiddly to clean properly, and taking apart an extensive tube system for cleaning is a real labor of love! It is also quite expensive to collect enough accessories to end up with a habitat that is the right size for your pet or pets to be happy and healthy. Also, the larger Syrian hamsters can grow too big to properly use some of the tubes and accessories when they reach adulthood and this can be anywhere from uncomfortable to dangerous for your pet. The solution to all of these problems is the same! Using tubes and add-ons, supplement your existing habitat with a DIY bin cage, or start right off with a bin cage! Don't forget that later if you wish to, you can create more bins or purchase other cage types to add to your habitat. They are very inexpensive and the tools and supplies needed are easy to get, giving you a large cage for much less than you might spend for a commercial cage of similar size. They have space, ventilation, are easy to clean, and are endlessly customizable to fit your needs and those of your pet. The biggest disadvantage of a bin cage is the DIY aspect. They're a bit of work to put together! But for some (myself included), that is really part of the fun. Any other disadvantages tend to be more down to how you've created it than anything universal to bin cages, but careful research ahead of time minimizes these, and you learn from each cage you make (the first will probably not be your last, they're too much fun!). 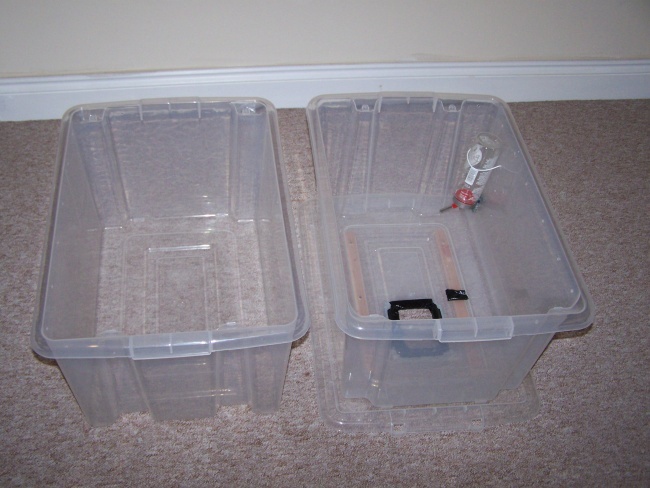 Additionally, you can make smaller bins that can be used for quarantining a sick pet, taking a pet in the car, or safely housing your pet while you clean their cage. I will caution you to select your initial bin carefully, with close attention to the sturdiness of the plastic, the fit of the lid, and the size and shape of the bin. Most plastics used in bins must be dealt with carefully during construction to avoid cracking. Check the bottom of the bin for any bits that stick up, as some pets may chew these. Don't forget the importance of research when designing and creating your pet's environment. Step one of this project is always to look into the needs of your animal and list them, mentally or on paper, along with your own needs and wants for your space. Does your pet like to climb? Dig? What can they physically do? Can they easily reach food and water? Are there enough places to hide? Are any ramps or ladders safe for small toes/tails and do your pets feel comfortable enough to use them? It can be useful to research how your pet's species lives and nests in the wild, and how domestic fanciers commonly accommodate those needs in captivity. A crucial part of this research is to look at other designs and methods so you can form your own plan for how you will meet all the criteria you've listed for your habitat. Find out what others have done that worked for them or that did not work. In planning how you will construct your cage and where in your home you will place it, keep your pet's comfort and safety first in your mind, but also consider your enjoyment of the habitat and of your planned interactions with your animal- how easily can you reach the cage, or reach inside it to care for your pet? Is it near any drafts or heating elements? Can other pets or small children get to it unsupervised? Can you view your pet? Will they make too much noise at night when you want to sleep? Will they be too disturbed by house commotion to sleep during the day? Having concerns like this in mind beforehand will prevent you from making a cage that will cause headaches later. I began by doing a lot of research into styles of bin cage, tools, and construction. There are some great tutorials around the web for this project. Here are some links that proved very useful to me, and I hope they are useful to you as well! 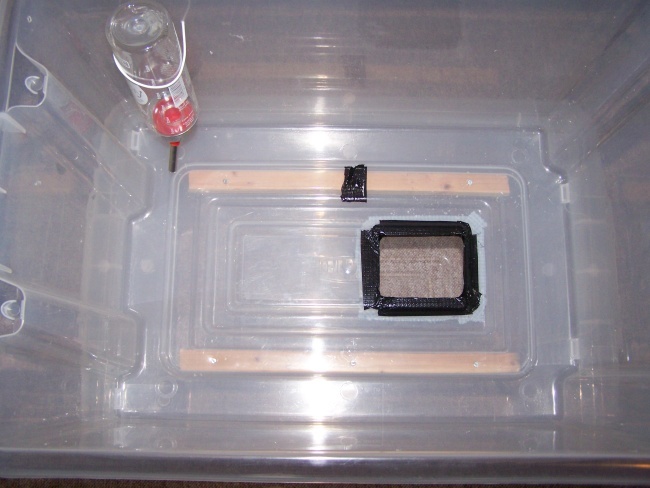 A page on the I Heart Hamsters site about making bin cages. A step by step tutorial with pictures, very helpful! A post on the Hamsters LJ community with some great tool tips. Some more information about bin cages from the members of a hamster loving forum. This video illustrates the importance of planning as the narrator explains challenges they had with a previous cage! Learn from others' challenges. A nice design! Excellent advice on how the bin cage improved her hamster's conditions. This video shows that this project is appropriate for many ages and can be made with even a very basic set of simple tools, while also showing that some tools (like an electric drill) can make the process much easier and faster. It also illustrates some of the ease and fun in customizing enhancements for your pet's space! This person is at least as excited about bin cages as I am! She also demonstrates two connected bins. Making a folding lid. Good show of different tools as well. An amazing and thorough three part series on step by step bin construction. If you watch nothing else, watch these! There are lots more where that came from, do a few searches and browse around! So now that you have looked at a lot of information (including some great books and websites about what your specific animal needs to be healthy and content) and have a good idea what you're doing and what design you want, let's assemble your basics! Other tools or supplies are up to you when it comes to customization. THE SKY IS THE LIMIT! But no matter what there are some things you'll need on hand. A bin, of course! Select your bin with care. Make sure the size is good, the plastic seems sturdy, the lid fits snugly and comes on and off easily, and see that there are no rough or pointed bits inside, or any place a rodent could sink their teeth and get a hole started in the corners (some bins have corners that poke up on the inside). A utility knife. The sturdier and better quality it is, the easier your work will go. Wire mesh or hardware cloth for large ventilation areas and for the center of the lid. Means to attach the wire mesh/hardware cloth. Zip ties work well, as do nuts and bolts. Avoid glue, it isn't strong enough and might be toxic if your pet can reach and tries to chew. Wire cutters to cut and shape the mesh/cloth. Gaffer tape or duct tape. This doesn't always look gorgeous but is very handy for securing and smoothing any sharp edges. Your pet's safety is foremost! 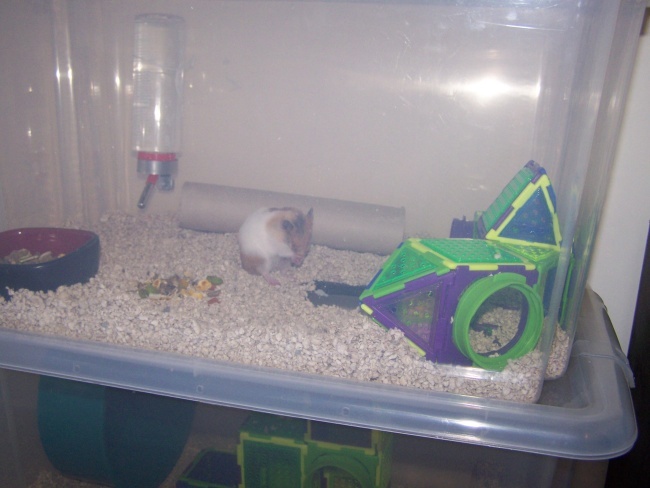 I used the tape on the hole between the two floors of my bin cage to make sure my hamsters could not catch their toes in between the bottom of the first bin and the lid of the second, or be cut on sharp plastic edges. You might not end up needing it depending on your design, but I still list it as a must because it's important to secure down and cover anything sharp or poking before putting a pet inside the cage! A drill or screwdriver, or other device for making holes in the bin. An electric drill will really be a boon here, the project will be faster and much easier than with a screwderiver or chisel. Holes will be important for ventilation as well as for the means to attach accessories like water bottles, and possibly for attaching the wire mesh or hardware cloth if you would like to use zip ties. Store-bought tubes or connectors. Be mindful of the size, some brands are wider than others and if you have a larger pet like a Syrian hamster you will want a tube big enough for him or her to fit. Small pets like mice or dwarf hamsters can fit through smaller tubes as easily as larger ones so it isn't as important to watch out here where they are concerned. You'll need these if you plan to add your bin to an existing setup or start off creating an expanded setup. 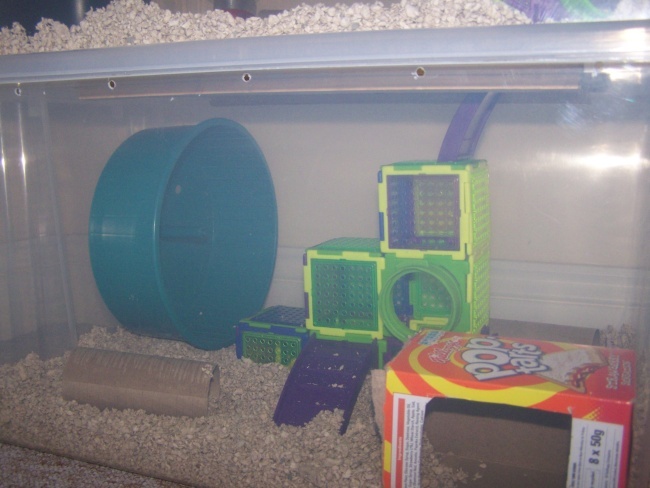 Depending on what kind of cage you already have, you may also need to get a special lid or piece to ensure your connecting tubes will be able to fit into the existing cage without allowing the escape of your pet. Ladders for climbing to elevated areas of the cage if you have created any. These may be bought or made, but when making them, try to take care that they will not catch your pet's delicate feet, or poke them with sharp edges. Small scraps of wood for bracing certain areas can be useful depending on your bin, and may extend the life of your cage. My bin cage has been braced with scrap wood where I screwed the lid of the bottom bin onto the bottom of the top bin, and also on the lid where the hardware cloth is attached. Be gentle to the plastic and go slow with the drill and utility knife! These bins hold up well once constructed but were not really designed with being punctured in mind, so rough handling during construction can crack them. If you can brace them on/against something, perhaps using a sawhorse or utility table, this is very useful. Even if you don't intend to permanently attach scrap wood as a brace you may want to drill through the plastic into a piece of scrap wood if able. Get a friend to help! Attach things to the outside of the cage where possible, to minimize your pet's opportunities for getting into trouble. Don't forget that you have to regularly handle the cage as well, to clean it and to care for your pet, so minimize sharp or pointed edges. If you need to, don't be afraid to be generous with your gaffer tape now, you'll be glad when you don't have to be generous with bandages later! Duct tape can work too and comes in colors and patterns to make your cage look spiffy. If you have an elaborate plan for your cage that you haven't tried before and don't have detailed instructions for it from somewhere, you can save yourself money, time, and the headache of a ruined cage halfway through the project by trying to do a small mockup first using cardboard, just to test out how it is going to work. Rescues are always in need of supplies, and when rodents are involved, one item always in short supply is cages! Requests for donations of cages don't always result in enough to go around-- most people who have a cage going spare at all only have one. Bins, however, are cheap and easy to come by, and even people who don't have pet rodents might have some to spare or be willing to purchase one or more for their local rescue. Some can be had at Poundland in 100 quart size! Knowledge of how to construct a bin cage is therefore an invaluable skill for any rodent rescuer! And what a fabulous charitable project for any community-minded group! A rescue, a classroom, a club, any small crowd with a passion for animals and a little time and ingenuity can throw a "cage party" and get a good number of habitats cranked out in a single afternoon for donation to their favorite charity that rescues rodents. You'd be amazed what determined volunteers can accomplish with a few hours, a half a bag of crisps, and a pot of tea! Here's a cage we made for a rescue we foster rodents for sometimes, with a pair of foster rats, one on each level. I hope you have enjoyed browsing this page, and I wish you success in creating a habitat that you can enjoy with rodent pets for years to come! 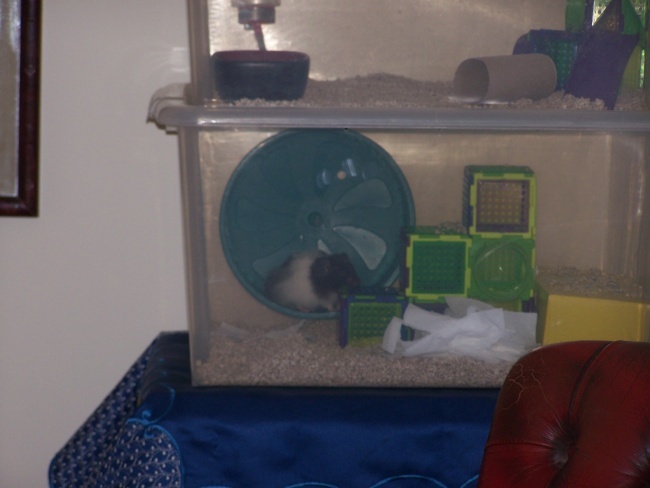 Sprinkled throughout this page are photos of our first setup and the two successive Syrian hamsters who have lived in it so far! The short-haired girl was the first pet my partner and I have owned together, her name was Chimera. Our current hamster, a long-haired Syrian named Yeti, lives in a large two-tier bin cage and currently has no additions on it. He gets playtime outside of the cage in the tub, in his rolly-ball, and climbing on his humans. They are our favorite little monsters! "Bye bye, make your rodent a nice cage like mine okay?" This page was created by Kimberleigh Malay in 2011. To contact the author or see more of her work visit her website: Bowl of Serial.